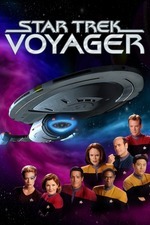 [two-part episode] Most of the crew of Voyager is kidnapped and brainwashed into joining the labor force of an alien planet, where they are repeatedly re-indoctrinated into forgetting their previous lives. But, hey, the benefits are great. - Among the aliens on Quarra whom Voyager had met previously were Kraylor, Benkarans, Brunali, and a somewhat more purple species that closely resembled the Benzites. - The Quarren vessel that attacks Voyager in this episode is actually a modified re-use of the CGI model of a Breen warship which appeared in various episodes of Star Trek: Deep Space Nine. - The Doctor becomes the Emergency Command Hologram for the second time in the series. Unlike his fantasy version, the actual ECH doesn't wear Captain's pips. - For the second time in the series, The Doctor is the only one left on Voyager that can do anything, and other crew members are off-ship. The first time was "Macrocosm" when the crew was incapacitated. - [The second part] was the second of two Star Trek: Voyager installments (the other being Season 6's "Riddles") that were directed by Roxann Dawson, who usually played B'Elanna Torres in the series. She found that being assigned, by Rick Berman, to direct this episode was a memorable moment. "I remember when he handed me my second episode, because he said something I'll never forget," Dawson revealed. "We were at some function and I was very curious as to whether he thought I did a good job on my first one and was ever going to give me another chance. He came up to me and said, 'So, I'm going to give you another opportunity to fail' [....] I think it was sort of a compliment, but I think he was giving me another opportunity and saying, 'There's nothing guaranteed. You did OK on this one, but you could fail on the next one.' So I think it was a 'Don't get too full of yourself' kind of thing." "Maybe all those command subroutines are compromising your medical abilities." "Maybe all that sarcasm is compromising your natural charm." "I've repaired the deuterium injectors, brought secondary propulsion back online, and soothed Ensign Kim's upset tummy." "I was the victim of mind control." This is one that I didn't watch during the original run, and watched only the first part of later. I may have skipped the second half originally because it bears a close similarity to the premise of "The Killing Game"--aliens kidnap the crew and brainwash them into new roles, and someone has to not only free them but restore their previous identities--plus, it's yet another S7 social commentary episode. But I still appreciated it this time around, because, even though "The Killing Game" was more fun, in some ways this episode was just done a bit better. The more overt brainwashing that Doctor Kadan (played by Don Most, probably still best known as Ralph Malph from Happy Days; his co-star on that show, Anson Williams, directed several Trek episodes) did to the crew not only give them different personalities to greater or lesser degrees (Seven was still an efficiency expert, but Tuvok told jokes (badly) and Janeway was seemingly happy in a subordinate role) but also had them repeating the importance of their jobs in their lives almost constantly. It reminds me of an adaptation of Brave New World done about twenty years ago, starring Leonard Nimoy, that updated Huxley's book for the 1990s; you had characters repeating the catchphrases that they'd helped popularize (i.e. "half a gram and you won't give a damn", referring to soma), as if they were received wisdom instead of the memes that they themselves had created. When Kadan is confronted by his younger, more idealistic colleague, his rationalizations are smooth and instinctive; see, he's just doing his job. I really wanted him to be the one to be stuck in his own machine, a la the evil doctor in TOS' "Dagger of the Mind" (another episode that this one owes a certain debt to), but that would probably have been a bit too neat of an ending. It's not perfect--I'm not sure that going to such lengths to get 100-odd workers, even really skilled ones, makes sense economically, and I also have my doubts that the planet's government was completely ignorant of Kadan's scheme--but that didn't break the episode. Had fun watching the ECH and the Eternal Ensign jockey for command. Poster's Log, supplemental: If they'd been stuck on the planet, I think that eventually Tuvok would have published a book of dad jokes. Also, "Dysphoria Syndrome" as the name for people shaking off their brainwashing is a very Brave New World-ish term; dysphoria is defined as "a state of unease or generalized dissatisfaction with life", and defining it as some disease to be "cured" is just all kinds of wrong. So i would like to give Beltran the credit for the little heartbreak moment. Chakotay has been holding out for Janeway, thinking that if they weren't Lost in Space, if it was not for duty and pesky uniforms, they would be an item. But then he sees how quickly Janeway gets a man when there are not those things holding her back, and Chakotay sais nothing but his expression and body slump is full heartbreak. He finally gets that he will never have a chance. It makes his moving on via relationship with Seven more understandable,if not less idiotic. Particle of the Week: Tetryon weaponry plays a prominent role in the first half. * Maximum Possible Photon Torpedoes: -22. Voyager fired one that I saw. * Credulity Straining Alpha Quadrant Contacts: 15. More with the 'implausible DQ contacts' in the species in the factory. The Breen ship was pretty distractingly obvious, and it looked like Janeway's posting had a bunch of old Borg props in it too. * Some good relationship work. Janeway's subplot was actually pretty decent. I agree with thegirlwiththehat's take on Chakotay reacting to Jaffen, which counts as some sort of payout to the Ambiguous Bathtub Planet Adventure. Also, the Jaffen romance was actually handled pretty well. I was impressed after all the times TNG and even DS9 screwed that stuff up. On a similar note: Tom Paris showed off his skills as a decent human being again. His approach to B'Ellana in part one was surprisingly good, trying to look out for her instead of just being on the pull. This is some marked improvement over earlier Voyager, and it was a help with the rest of this. * The main plot is... sure something, all right. It's not perfect--I'm not sure that going to such lengths to get 100-odd workers, even really skilled ones, makes sense economically, and I also have my doubts that the planet's government was completely ignorant of Kadan's scheme--but that didn't break the episode. It did for me, but I have an actual (dusty and unused) degree in economics. I couldn't go two seconds watching this episode without going 'argh, this makes NO sense why are they even... ARGH!' Hahaha. For me, thinking about the plot here makes me feel like an android Captain Kirk is literally talking to death. Seriously, it's head asplode levels of nonsense. About the only fun thing I can say about it is it's an interesting window into the past - modern concerns about jobs are more about 'they're never coming back due to automation and cheap labor overseas,' so it was weird to get a look at people getting that so wrong a mere couple decades ago, and it only makes sense through the lens of Star Trek's meta/authorial bias against AI. Anyway... yeah. Weird contrast between the stuff they improved and the stuff that was crazymaking. Also, I would read the Tuvok Joke Book. For more on this topic, be sure to watch the Stargate SG-1 episode "Beneath The Surface" in which: "Major Samantha Carter, Dr. Daniel Jackson, Colonel Jack O'Neill and Teal'c are somehow working as miners on the ice-age ridden planet of P3R-118, and are known as Thera, Karlan, Jonah and Tor respectively. Meanwhile, the SG teams are searching all over the ice covered planet for any signs of SG-1, who have gone missing." Sound familiar? Original airdate on this one was September 1, 2000. An advanced alien city sits in the middle of a planetary ice age. The elements rage around it, but the city remains protected by a giant dome. Deep underground, the working class maintains the systems that power the great city — though they do not even know it exists. Four of these workers are SG-1. Colonel Jack O'Neill, Major Samantha Carter and Dr. Daniel Jackson line up for the afternoon meal. Kegan, the young woman who dishes out their food, is not happy to see Carter. She refuses to give her bread, and a scuffle ensues. Daniel and Jack end up in a fight, but Teal'c grabs the colonel and tries to stop him. He tries to convince them that they are friends — that all four of them are part of something called "SG-1." Teal'c is dragged away shouting, "We do not belong here!" The memories of SG-1 have been wiped out — or at least covered by false memories. They know of O'Neill as "Jonah," Carter as "Thera," and Jackson as "Karlan." Teal'c, they believe, is called "Tor." While O'Neill and Carter seem to know each other well, Jackson is estranged to them. He spends his time with Kegan, his friend. Living conditions for the workers are rough, and their days are hard — but they believe it is an honor to serve, that they are helping their people survive an ice age. On Earth, Major General George S. Hammond is in contact with Administrator Calder — one of the alien city's local leaders. SG-1 has been missing for many days. Calder explains that the group had gone out to explore the nearby glacier region, and never returned. Hammond sends an SG team, led by Major Michael Griff, to look for them. Beneath the surface of the planet, Jackson begins to dream about the Stargate and about O'Neill — but cannot figure out what the shimmering circle of water is. Slowly, his memories start to resurface. He believes that Jonah and Thera — and even Tor — may have once been his friends, and that they are supposed to be doing something bigger, something more important. His friend Kegan tries to dissuade him, believing that Carter and O'Neill are only trying to win special treatment from Brenna, the workers' foreman. But Jackson continues his search for the truth. He realizes that he cannot remember very far into his own past, and finds that strange. He speaks to Teal'c when he returns—but the Jaffa tells him he was night sick and does not know him. In Administrator Calder's office, Brenna has brought some of Sam's ideas to share with her supervisor. Carter has many good ideas for improving efficiency at the plant, but Calder isn't interested; he worries that one day, she might make things so efficient that the system does not require workers at all. He is interested only in maintaining power—both literally and figuratively — and keeping the working class subjugated to the people above whom they serve. Sam's ideas are rejected. Major Griff's team returns to Earth, reporting that no sign of SG-1 was found on the glacier. Beyond that, though, Griff expresses doubt that O'Neill would have ever let his team go out there, and that if Administrator Calder said that was the case, he must be lying. Later, while moving to release the pressure from one of the machines, Teal'c passes out. The pressure rises dramatically, threatening to explode and take out the entire section. Daniel, Jack and Sam work together to save the facility. Daniel takes the opportunity to try and get to know the two better, and learns that Sam has had the same dream—a dream about the Stargate. They agree to meet after lights out. Carter, Jackson and O'Neill continue to slowly remember more and more of their pasts. Sam recalls details about the SGC — names like "SG-1," "DHD," "GDO." Jack begins to remember his feelings for Carter, and the two grow closer. Personalities begin to resurface as they continue to dig deeper — expressions, like Jack's "for cryin' out loud," escape. Sam inadvertently refers to O'Neill as "sir." In a dream, O'Neill remembers seeing the city and speaking with Calder. He confronted him about the slave labor underground, and refused to recommend trade with this world. Calder had SG-1 captured and stamped them with new personalities in order to keep the secret slave labor from being revealed. Brenna is dissatisfied with Calder's treatment of the workers. Some days later, she reports back again: SG-1 has been seen meeting together late at night, and there is evidence that they are beginning to remember. The memory stamp ordered by Calder is not keeping its hold. In addition, Teal'c is now dying. He cannot remember to kelno'reem, the Jaffa meditation process that allows his symbiote to cure him of illness. Calder orders O'Neill, Carter and Jackson expelled to the surface, to die in the cold. General Hammond has very few choices other than breaking off diplomatic relations with the planet. Instead, he orders Griff to draw up plans for a covert search and rescue operation. Fortunately, the mission is not needed. Brenna, herself a worker, decides to act against Calder rather than expelling SG-1 to die on the surface. She brings all four of them into her office and tells them that their suspicions about false memories are true. Brenna explains who they really are — but before she can help them to escape the facility, Calder arrives with two armed guards. He shoots Brenna in the shoulder for her disloyalty, and turns his weapon to SG-1. Teal'c awakens suddenly and overpowers the guards, and O'Neill grabs Calder's weapon. Teal'c explains that he undid his bandages (covering his symbiote pouch) in the night. When he realized he was different from everyone else, he began to remember who he really was. He put himself into a deep state of kelno'reem through the night, and woke up healed. Before they escape, O'Neill drags Calder in front of the workers and tells them the truth — that they are slaves to the city above. To prove it, Jack shoots out a skylight overhead. Instead of ice and snow burying the workers, they feel the warm rays of the sun. Brenna tells SG-1 that their memories will return in time, especially once they are home. They will take her with them to receive treatment for her wound, and promise to relocate the workers to a tropical world they have recently found. Calder and his people will have to work for themselves for a change. Wow, Servo5678. The optics on that are pretty bad, especially with VOY's "black alien" character shouting basically the exact same thing as he's being dragged away. I don't know how far in advance the show's episodes are written and filmed--this one had a fair amount of post-production work, probably--but... hmm. It does look pretty bad, and I tend to think of the Voyager backstage guys as pretty hinky, both because of later anecdotes and because of the Nick Locarno/Tom Paris thing. So, thanks for the heads-up. Mang. I was going to make a wager that this episode's A- and B-story concepts were inspired by the entire VOY cast and crew starting to think about THEIR new jobs. But that SG-1 thing has me wondering. I mean, had they explained that, oh, say, the average voting Quarren simply refused to do the type of work that the shanghaied aliens were doing? Then you might have some social commentary. But the mere fact that they presented these jobs as "eh, pretty good" rather than the more plausible slave labor suggests that maybe they were scared of trying social commentary here that hit with any degree of hardness (which was actually maybe the right call, given their recent track record with that). OR they were trying to differentiate this teleplay as much as possible from that SG-1 one. The thing about the ripoff theory, though? Is would you really rip off another show for a big two-parter event that people are wayyyy more likely to notice? Also: honorable mention for an appearance by the long-forgotten Baxial, the entire long-range ship that's been in Voyager's tiny shuttlebay this whole time, failing to be employed for plot purposes like this.